Some of the employees working within the libraries once had other roles and separate affiliations with Middlebury. Follow their (r)evolutions on the first Thursday of every month this semester. 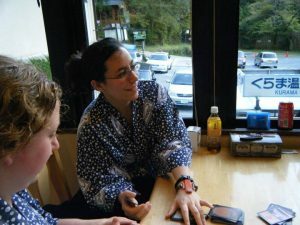 When I was studying abroad in Kyoto in 2010. This was before we had established a Midd-specific school in Japan so I was there via the Associated Kyoto Program (AKP). I’d gone up to Kurama Hot Springs with a bunch of friends for a day of cultural enrichment (i.e. soaking in huge volcanic baths) and inter-college outreach (i.e. goofing about with fellow study abroad students from other schools). We had gathered a small group of Magic enthusiasts and were playing in between soaking sessions; we were using Japanese cards of course, so studying was still happening. We were just also in our fancy robes, sipping tea, occasionally amusing the other hot spring patrons. I seem to remember several little old ladies approaching us in the bath to chat. It was a delightful day. I’m a couple years older, a couple degrees further in debt, now thoroughly obsessed with fiber arts, and very much turning into a crazy cat lady librarian. Also my Japanese is much, much better than it was then. I still love hot springs, though my access to them is now non-existent. I also drink entirely too much tea, study Japanese whenever possible, and play geeky games on a regular basis. I love seeing all the interesting books that people request through ILL. We see some really cool things requested for research purposes, from microfilm of obscure government documents to foreign language comics to massive road maps. As schools borrow things from our library we also get to see some of the coolest books from the stacks that I would never have thought we’d have. And then there are just the awesome book recs we get from people ILLing fiction of various kinds. ILL is a spectacular place to work if you love books. I’m currently working my way out of debt and trying to establish a home that is a little less temporary than my string of dorm rooms and office-provided apartments. Other than that, I haven’t thought that far into the future. Right I’m just taking things one day at a time. This entry was posted in Library News, libspotlight, LIS Staff Interest, lisblog, Middlebury Community Interest, middpoints, Post for MiddNotes, Post for MiddPoints and tagged Japanese, Library Spotlight, libspotlight, Throwback Thursday on November 2, 2017 by Katrina Spencer.